One of the most common ways to disparage communism has been to point to the violence which went into its making. 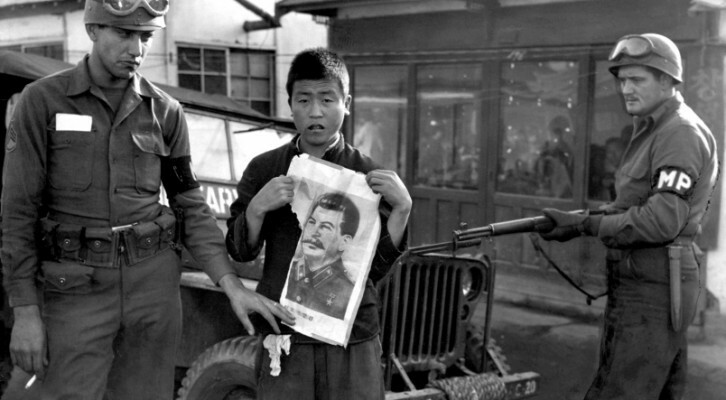 Sometimes, the numbers of people who were killed by communist regimes like the one in the former Soviet Union have been exaggerated to a degree that can only be characterized as comical. Some historians have claimed that Stalin had killed almost 100 million people in his purges. This claim falls on its face immediately when one employs a minimum of basic logic. Given the fact that the Soviet Union lost about 27 million people during WWII and that its population was somewhere around 100 million people after the October Revolution, it would seem that the number of people Stalin killed would be greater than the total number of people who lived in the entire country, which is completely absurd. On the other hand, the numbers reported by some more serious historians should also gives us pause because, with the exception of WWII, the population of the Soviet Union was on the constant rise. In 1991, shortly before the collapse of the Soviet Union, the population of that country was the highest ever. It is also worth pointing out that number of people living in Russia declined significantly in the decade following the collapse of the Soviet Union and has since then been recovering. Despite all of this, there has undeniably been some violence in the Soviet Union particularly under Stalin but the number of people killed definitely pales in comparison to the actually reported numbers. Nonetheless, some would claim, one person killed is one too many. Well, let’s then take that argument and compare it to the history of capitalism. After all, in order to disparage communism, this argument is only valid if the rival system, capitalism, was much more peaceful and less violent than Soviet communism. However, when we actually take a look at the history of capitalism we find that the violence that went into its making was far greater than what went on in the Soviet Union even when we rely on the ridiculous figures cited above. There were many important pillars that were placed in the foundation of modern capitalist systems all of which included some degree of violence, but here I would like to tackle only thee of those. First, it is by no means controversial that the process of Enclosure in Great Britain was a precondition for the rise of capitalism. The process of Enclosure involved violent seizure of the common land that peasants used for farming and raising livestock. During the 18th century, most of this land was seized by wealthier farmers in order to create vast possessions on which to raise sheep and produce wool for the rising textile industry. The unknown numbers of peasants were then forced to move to the city and become a cheap labor force that had to work under unimaginable conditions in order to survive. It is not at all surprising that the life expectancy of these people was under 30 in many cases. Essentially, they were simply worked to death. However, it is also not surprising that peasants revolted against this violent seizure of the land that they had been using for centuries and large numbers of them were simply killed in the revolts. Secondly, the discovery of America was one of the key engines that drove the rise of capitalism. The abundance of resources in this country was the fuel that generated the enormous explosion of wealth, which in turn created the European bourgeoisie. The acquisition of these resources was not a non-violent process at all as North America was populated by millions of American Indians (today referred to as Native Americans). To acquire their land, Europeans in many cases had to fight them to death and in the process they wiped out virtually the entire population committing some of the most outrageous atrocities in human history. It is by no means an overstatement to say that this was the first case of genocide or holocaust in human history and that is something that has to be taken into account in every discussion of capitalism, socialism and violence, but unfortunately it is not. Next, the build up of America was also crucially dependent on Atlantic Slave trade in which by conservative estimates, about 11.5 million Africans were shipped to North America to work mainly on cotton plantations. These people were treated simply as natural resources and not as human beings. There were many instances when slaves were thrown overboard when a ship had to reduce its cargo faced with a storm or some other kind of challenge on the open sea. There is no available figure about the number of slaves who were killed this way. Also, those who did arrive to North America were also subject to various kinds of torture and treated as cattle that worked as much as it could and left to die after its strength disappeared. Thirdly, to arrive at the status of industrial superpower, the United States, employing a capitalist mode of production had to exert tremendous force in order to keep the wages of workers low and secure their obedience. All of this is a part of 19th century US history, which is something everyone should learn in history books and yet it is often simply skipped. As a famed US historian Howard Zinn points out, the US had one of the most violent labor histories in the world. Often, the army was employed to shut down workers’ strikes. On numerous occasions, the army would open fire into the unarmed workers killing dozens of them at a time. Moreover, the conditions in which workers labored were so unsafe that industrial accidents like fires took thousands, perhaps tens of thousands of lives. In one such accident in 1911, in a shirt factory in New York, around 150 young girls lost their lives in a fire due to unsafe working conditions. It should be stated that during this entire period, workers had no rights, very little schooling and virtually no healthcare protection. In the case of Soviet Union, it is worth pointing out that the country was transformed from a feudal agricultural economy with illiteracy of about 95% to an advanced industrial nation during several decades. This entire process took far less casualties than industrialization under capitalism in the West. Not only was industrialization quicker and more efficient but the workers had all the rights to organize and participate in decisions. They had a right to universal education and healthcare. Also, a lot of attention was paid to the working conditions. The violence that took place in the Soviet Union was largely political and it was aimed at those who wanted to restore the Tzarist regime or opposed the progressive reforms. On the other hand, the violence that took place with the development of capitalism in the West was structural, which means that it was the result of the very process of capitalist industrialization. It was exerted through all the existing social institutions and aimed directly against the vast majority of the population – namely, the working class. This capitalist violence, if it did not kill people it left them alive only to work for as long as they can and then to die in utter destitution. The argument against communist based on violence that went into its making is then simply a case of using double standards. Surely, there was some violence but this kind of violence pales in comparison with the atrocities that went into the making of capitalism.